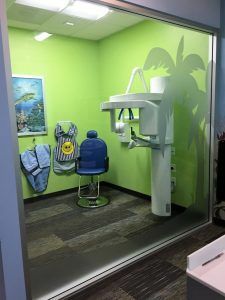 Last week we went over the new logo we created for Children’s Dentistry of Redlands along with the indoor window graphic we made. We made two more window graphics, however this time we decided to go with etched vinyl instead of white vinyl. 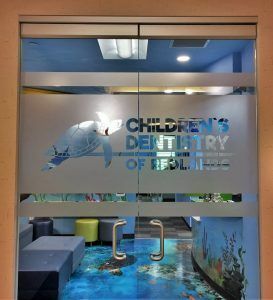 Etched vinyl creates a frosted glass effect. When you use it to only partially cover the window, it creates a great look for windows and doors that are meant to be seen through. The office’s front doors are glass double doors so we had plenty of space to work with. Instead of just cutting the logo from the vinyl, we kept a rectangle of etched vinyl and cut the logo out of the vinyl. We also added thick borders on the top and bottom of the logo. They also wanted some graphics for their X-ray room window. We were initially going to use white vinyl, but after looking at the proof the customer decided that etched vinyl like what we were going to use for the front door would look better. One wall of the room was almost completely made of glass so they wanted to use the space wisely. Once again, to go with their business theme, we cut out the silhouette of two coconut trees and sand from vinyl. The trees are to the side to not block too much of the window, and the sand just borders the bottom part of the window to create a nice frame in the window. The last sign we made for the interior of the office was the lobby sign. The lobby already had a part of the wall with a pattern that illuminated so they wanted a sign to fit in there. We took the new logo and made it completely from brushed aluminum. Each letter was routed out individually and we cut the bar into two sections since it overlapped with the turtle’s fin. For the turtle, we cut the outline out from aluminum and all of the details from the turtle’s shell to it’s wrinkles were cut from black vinyl and applied onto the aluminum. We mounted the sign 1/2″ from the wall to create extra dimension and the lighting from the wall creates great looking shadows around the logo. There are many ways to illuminate a lobby sign. 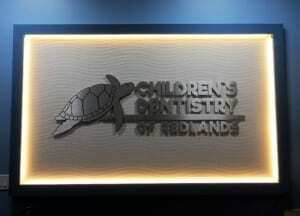 If you are interested in an illuminated lobby sign but you don’t have an existing light source like Children’s Dentistry of Redlands, we can create a sign for you that incorporates LEDs.